Nick Fury and Maria Hill Confirmed for Avengers 4? 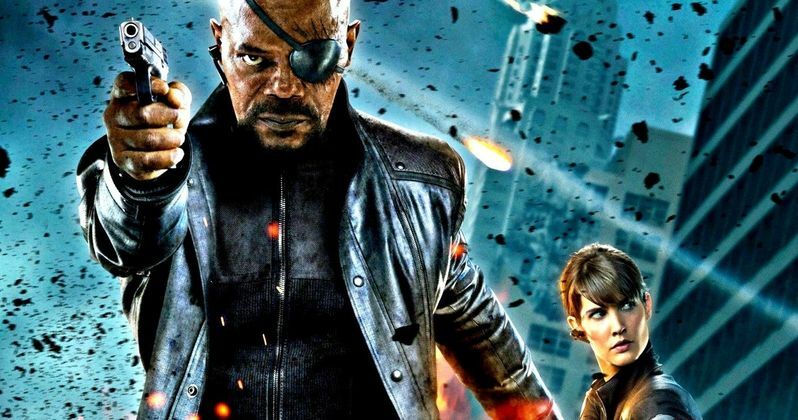 Over the weekend, Marvel stars Samuel L. Jackson and Cobie Smulders were spotted filming for an "upcoming Marvel project," and while it hasn't been confirmed what this project may be, it seems likely that it could be for Avengers 4. Still, one big flaw in that theory is that Avengers 4 wrapped production just a few weeks ago, and it may be too early to start reshoots already, so it's possible that this "upcoming Marvel project" could also be Captain Marvel, since Samuel L. Jackson's Nick Fury has been confirmed to return for that project, although production isn't expected to begin on Captain Marvel until next month. What's even more confounding about these photos is that there are some photos where Nick Fury is seen wearing his iconic eye patch, and some where he is not. It has been confirmed that Captain Marvel is set in the 1990s, and that the movie will feature a "de-aged" Nick Fury, with many speculating that this movie could show what happened to Fury's eye to cause him to wear that patch for all these years. If these were actually from Captain Marvel, he likely wouldn't need the patch at all, which has lead many to believe that these photos were taken on the Avengers 4 set. While there had been many reports that Nick Fury wasn't appearing in Avengers: Infinity War or Avengers 4, a casting call in September seemed to indicate that Nick Fury would at least put in a brief appearance in Avengers 4. Since production has ended on Avengers 4 and filming has yet to start on Captain Marvel, it ultimately remains unclear where these photos are really from. It could be for a post-credit scene for Avengers 4 or it could be an indication that production is starting earlier than expected on Captain Marvel. Even in the photos where Samuel L. Jackson isn't wearing his eyepatch, you can see some scarring around his eyes, so it seems more likely than not that these scenes being filmed in Atlanta are for Avengers 4. It's also worth noting that Cobie Smulders as Agent Maria Hill would have to be "de-aged" as well if this were for Captain Marvel. Since Brie Larson's Carol Danvers has been confirmed for Avengers 4, which is set in present day, this could be a scene that helps bring Captain Marvel into the present day, although Brie Larson has not been spotted on the set. Just before production wrapped, more set photos teased time travel possibilities for Avengers 4, with Chris Evans spotted wearing his Captain America costume from The Avengers. Many speculated that particular scene was re-creating the Battle of New York from that 2012 blockbuster. There was also another December set photo from Scarlett Johansson's stunt double, where the actress was seen wearing the same outfit from the opening scene of Captain America: Civil War. It's possible that Avengers 4 could be quite nostalgic for some Marvel fans, if these iconic moments are re-created for this movie. Marvel Studios president Kevin Feige revealed in September that Avengers 4 is the finale for the current MCU superheroes that will provide an ending in ways fans won't expect. Avengers: Infinity War his theaters May 4, which will be followed by Ant-Man and the Wasp on July 6, Captain Marvel (March 8, 2019) and Avengers 4 (May 3, 2019) and the first Phase 4 movie, Spider-Man: Homecoming 2 (July 5, 2019). Take a look at some of these photos from the Atlanta set below, and head over to Just Jared for the rest.